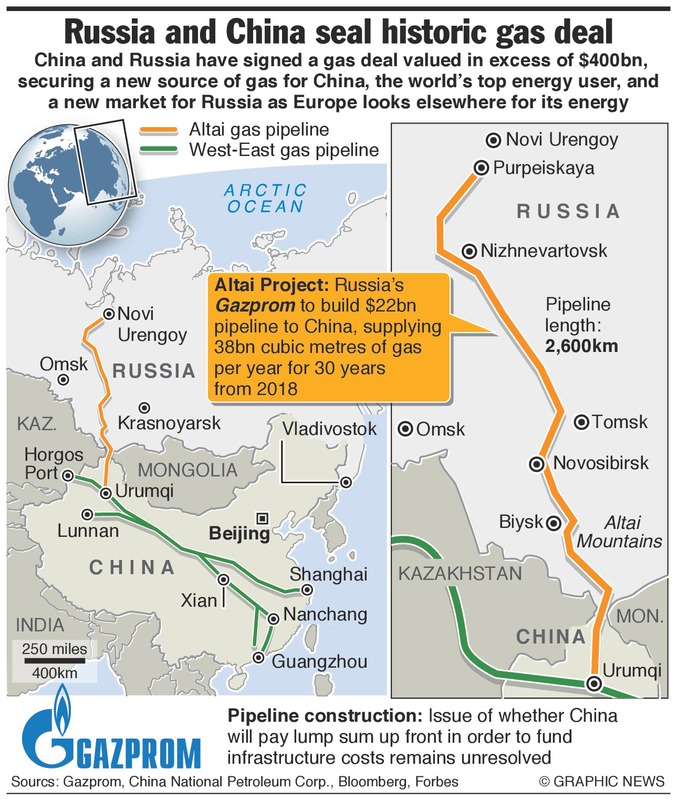 China and Russia recently agreed a ground-breaking new natural gas pipeline deal, worth around US$400 billion (although significantly it will be paid for in Renminbi not Dollar) following 10 years of tortuous negotiations. This will come on top of an existing bi-lateral trade relationship already worth around US$100 billion. The gas deal was signed at a time of Russian geo-political weakness as it fell out with Europe and the US over the Ukraine crisis, this meant it could not afford a poor relationship with China. This factor was no doubt carefully noted by Chinese diplomats as it strengthened China’s hand in negotiations, which in turn helped bring the price of the gas down and expedited the signing of the deal. In physical terms the agreement will result in the construction of a new pipeline to move the gas from Russia to China, along with the development of new gas fields in Eastern Siberia all of which will cost around US$55 billion, the cost to be shared between the two countries. I believe the gas deal will bring China and Russia much closer together, at least in the short term. Russia’s falling out with the West along with a need for new markets and a general pivot towards Asia means that it will need to seek closer ties with China, a country that shares its world view of protecting national sovereignty and resentment against US hegemony. In the longer term Russia might feel threatened by China’s economic influence in Central Asia and Russia itself, not to mention large scale Chinese immigration into its territory. But China also has much to play for, many have predicted its rise to become a superpower, but one factor holding it back is a lack of powerful and trusted allies, if Russia could take this role then Beijing could more realistically challenge the role of the US. The changing balance of energy use: linking the world’s biggest user of energy and its biggest supplier is a smart move, but it also underlines the rise of Asian demand for oil and gas and how this will alter the world’s energy map. Producers in the Gulf will be selling more to China, India and other Asian countries as demand continues to rise, this trend runs in parallel to the static demand seen in the traditional markets of Europe and the USA. The rise of the Redback. By paying for the oil and gas in Renminbi, the Russian’s can further undermine the US dollar by shifting trade payments away from what is currently the world’s reserve currency. At the same time the Chinese strengthen the power of their own currency, which is still not fully convertible, but is well on its way to being a major force in trade finance payments and one day a major reserve currency. China’s leverage over Russia will increase, as a major consumer of its energy Moscow will be looking to Beijing to ensure the bills are paid and this dependency will grow more acute unless Russia diversifies its economy. Russia will also gain sway in China, given it is a major energy supplier and powerful neighbour, but as Chinese energy supplies are fairly diverse (orginating in the Middle East, Africa, Central Asia etc) its leverage will not perhaps be as strong as some suspect.